March is when sports, film, music, and culture collide on Twitter. People will come to Twitter to watch the runways of #ParisFashionWeek, check out the musical acts of #SXSW, and see how their #MarchMadness teams are playing. 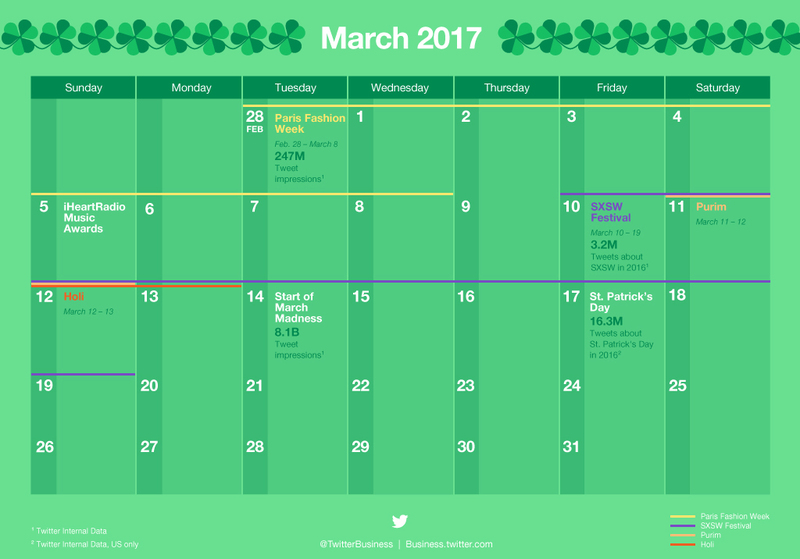 And with celebrations for Purim, Holi, and St. Patrick's Day, there are plenty of opportunities for your brand to show your personality on Twitter with relevant content. Download our March 2017 marketing calendar to help plan your campaigns around these key dates, and read on for tips on how to thoughtfully frame your content and creative throughout the month. 86% of college sport fans plan to follow March Madness*, and they're in it through the end — 78% of fans plan to watch the entire tournament. * Plan for daily conversation trends that will remain elevated over several days and weeks to join in on the experience. By being aware of how communities come together before, during, and after events you can plan topical campaigns that feel close to the action. Focus on creating content that will add value to your audience, and highlight your brand's personality in a genuine way. Rather than Tweeting a generic #HappyStPatricksDay or jumping in on every event hashtag, focus on Tweeting content that will resonate with your target audience. Share your expertise by tapping into relevant events and trending topics. If your brand is attending a big event like #SXSW or #PFW, Tweet behind the scenes photos and #GoLive with Periscope. If you're not attending the festivities, share your point of view on the events as they unfold.